Beeld en Geluid: The benefits of linking Thesauri for internal users. The benefits of linking Thesauri for internal users. 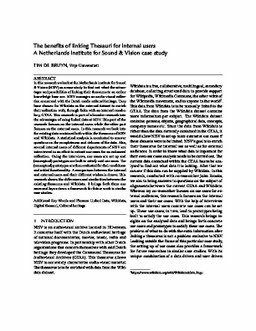 In this research we look at the Netherlands institute for Sound and Vision as a case study to find out what the advantages and possibilities of linking their thesaurus to an online knowledge base are. Sound and Visionmanages an audio-visual collection concerned with the Dutch media cultural heritage. They have chosen for Wikidata as the external dataset to enrich their collection with, through links with an internal vocabulary, GTAA. This research is part of a broader research into the advantages of using linked data at Sound and Vision. This part of the research focuses on the internal users while the other part focuses on the external users. In this research we look into the existing data contained both within the thesaurus of Sound and Vision and Wikidata. A statistical analysis is conducted to answer questions on the completeness and richness of the data. Also, several internal users of different departments of Sound and Vision are interviewed in an effort to extract use cases for an enhanced collection. Using the interviews, use cases are set up and (conceptual) prototypes are built to satisfy said use cases. The (conceptual) prototypes are then evaluated for their usefulness and added functionality. A comparison between the internal and external users and their different wishes is drawn. This research shows the differences and similarities between the existing thesaurus and Wikidata. It brings forth three use cases and lays a down a framework for future work in similar case studies. de Bruyn, T. (2018, August). The benefits of linking Thesauri for internal users.. Vrije Universiteit Amsterdam.